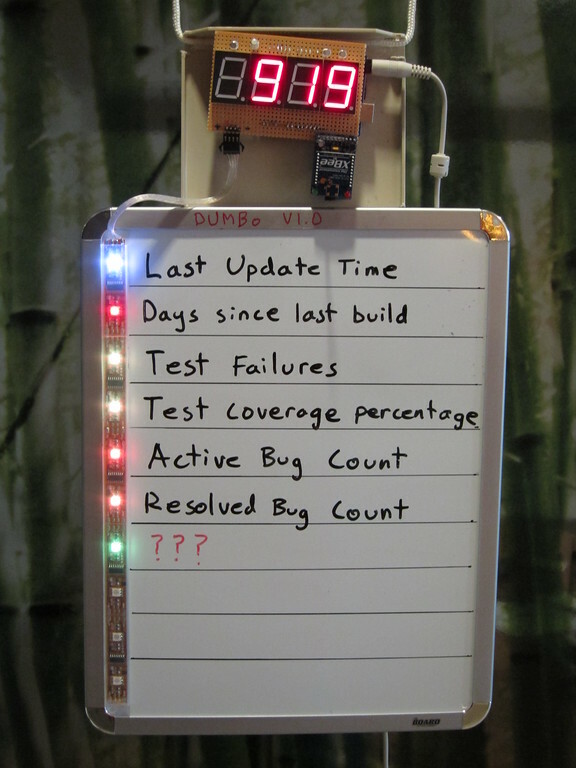 is completed, and has been hanging in our team area for the last week or so. Click to go to the gallery. My original concept was to drive it directly from a serial port – that gives enough power to drive the Arduino and displays, and all you need to do is just plug it in. That is still the preferred approach if you can put the board close enough to your main computer. In our case, however, the prime location is about 30’ away from where my desk is. Another option is to go with an old laptop, but to get the metrics I wanted, it has to be always on, connect to the domain, and then you have to deal with password changes, windows update, etc. So, a couple of Xbee 1s come to the rescue. This one is hanging through the board with the Adafruit adapter, and at my desktop I have the second XBee hooked up using a sparkfun adapter. Then, a bit of driver code on the PC to grab the metrics and send them out the serial port, and everything works. After a few iterations, I’ve settled on a scheme for the update. The current item in the lowest list is brighter than all the others. When the current item switches, the new item blinks off for 25mS, and then turns on. That makes the change obvious without being annoying.